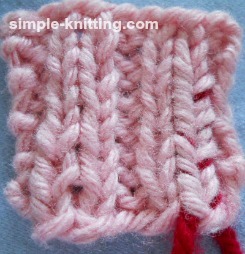 When you finish knitting, weaving in ends is simply a way to get rid of the loose dangling yarn ends that are left over. OK, weaving in ends is a nuisance! Best advice here? 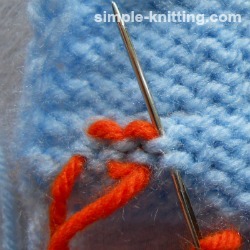 All you'll need is a tapestry needle and a pair of scissors. 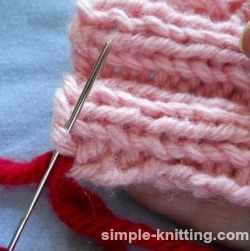 Thread your tapestry needle with your first yarn end and follow along. 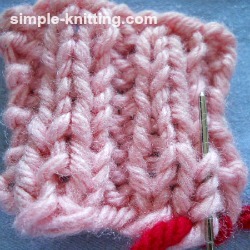 What you want to try to do is follow the bumps as you're weaving in ends of yarn. 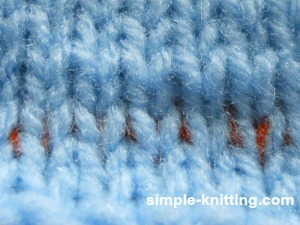 Note: Weaving in yarn ends on a garter stitch fabric can be done the same way because they have the bumps too. It will look something like the photo on the left. 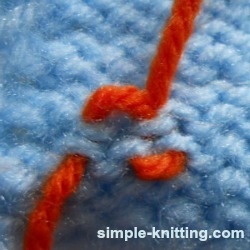 Next, on the right photo there is an arrow pointing to the next stitch. 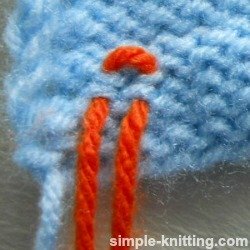 Skip that bump and put the needle into the stitch beside it and push up slanting needle a little so that it goes into the same stitch as the yarn is in at the top. This way you are kind of making figure '8's. The left photo shows what it'll look like. 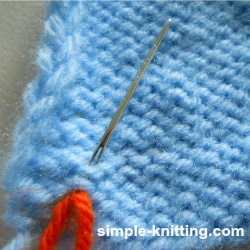 With your tapestry needle skip the next bump and go into the one beside it and push through and down slanting needle a bit to get the needle into the loop with the woven yarn already in it (at the bottom). See photo on right. 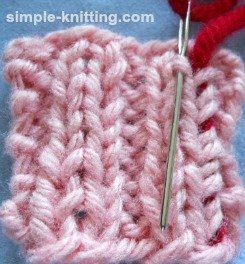 When you turn your knitting over you will see that it's almost invisible and with the same color yarn it won't show at all. 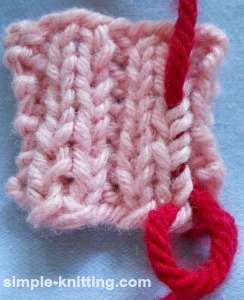 First dangly yarn end done. 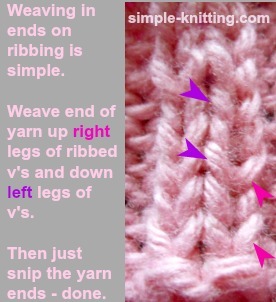 You'll find that weaving in ends for ribbing stitches is even easier. 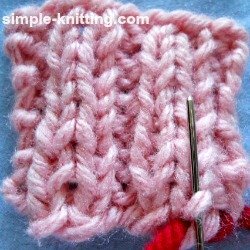 Rib stitches look the same on both sides so here's a great way to tuck in those ends so no one will see whichever side you use. 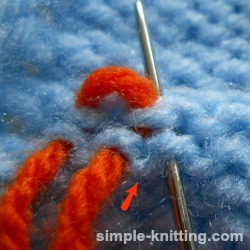 Thread your tapestry needle with the yarn end. I am just using a contrasting color in order to show you how. 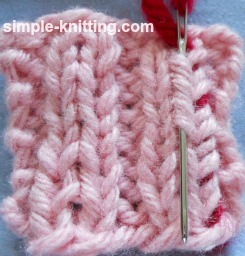 In the first photo I am just weaving through a stitch to line it up with the beginning of the rib stitches. 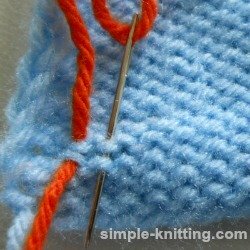 Keep catching the loops of stitches with your tapestry needle. It's almost like you're curling the needle around each loop to catch it. 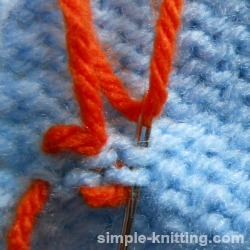 Just keep on weaving up all those right loops of the 'V'. And there. I went all the way up. 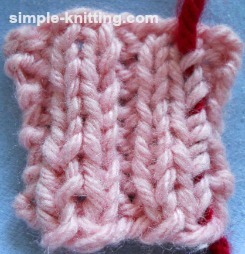 If this was the pink yarn end you wouldn't see it. And there you have it. You can snip off the ends and you're all done. See how it's barely noticeable? And it won't notice at all when you use the same yarn as you knit with. 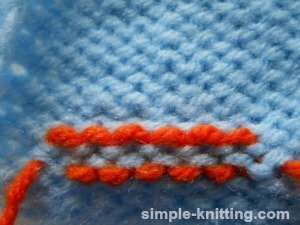 I found a great video showing you how to weave in ends as well so if you are still uncertain have a look.